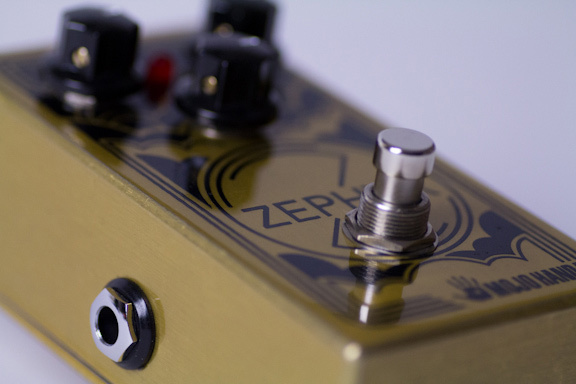 Home Mojo Hand FX Zephyr Fuzz Give Away – Reminder! Mojo Hand FX Zephyr Fuzz Give Away – Reminder! Here is a quick video of our demo a while back. Jimmy is playing the Zephyr Fuzz through a Germino Lead55 Head with his Gibson Flying V.
The Mojo Hand FX Zephyr normally sells for $160, so this is a great opportunity to pick this fuzz. I want say thank you again to Brad Fee of Mojo Hand FX for letting me give away this pedal to the community. Please take a moment to check out their website, as well as liking them on Facebook! Also, if you could please help spread the word. Let your friends know. Retweet this on Twitter and share it on Facebook! Boredbrain Music Patchulator 8000 Give Away! Would love to give this a spin, thanks!